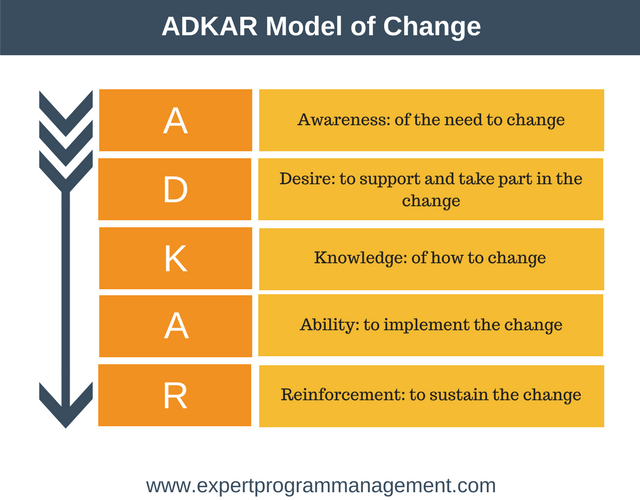 The Prosci ADKAR Model is a goal-based change management model that can be used to guide both individual and organizational change. The model is different from many other change management models because is it focuses on guiding change at the individual level. Jeff Hiatt developed the ADKAR Model of change in the 1990s. The model is based on analyzing both successful and unsuccessful change within hundreds of organizations over a number of years. 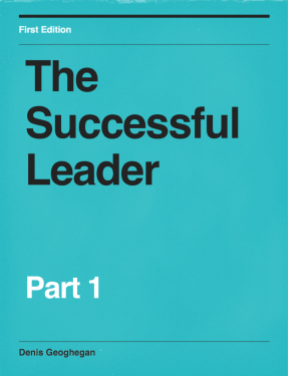 The ADKAR model is based on the fact that the main determining factor in whether a change is successful is people. The model emphasizes that successful change occurs only when each individual member of the team is able to change. Essentially, employees must support and embrace the change if the organizational change is to be successful. This is because change happens at the individual level. For the organization to change, the people within that organization must also change. The model shows five sequential actions and their outcomes that are necessary for successful individual change, and thus successful organizational change. The ADKAR framework is sequential, with each step building upon the outcomes of the previous step. The model allows leaders and change managers to focus their efforts on driving individual change. Doing this will, in turn, drive organizational change. The outcome of this step is that everyone has an awareness and understanding of the need to change. Each individual needs to be aware of why the change is happening and why the change is necessary. Without a full understanding of why the change is necessary employees will be unmotivated. This makes the change less likely to succeed. A key role of management in this step is to ensure everyone understands the need for change. The outcome of this step is that everyone has the desire to take part in and support the change. To achieve this outcome it is important to work with all individuals to achieve three aims. First, that they feel dissatisfied with the current state of affairs. Second, they should understand the negative consequences of keeping things the same. Third, people need to want to participate in the change. To achieve the final aim it’s important to explain on an individual basis what’s in it for them. This could mean enhanced job security, a sense of belonging to a team, career advancement, or even financial incentives. The outcome of this step is the individual having knowledge of how to change. Individuals need to be given the knowledge of what to do or how to change. They need to know what to do during the change, and also what to do once the change has happened. The outcome of this step is that the individual has the ability to show new skills and behaviors. A great quality of the ADKAR Model is its distinction between theory and practice. Once the knowledge of how to change (theory) is in place, then the individual needs to be supported during the actual performance (practice). Ways for management to support new ways of working include providing a safe environment (for example a Model Office), or by continuing to provide coaching and mentoring. The outcome of the final step is that the new change or behavior is reinforced within each individual. This final step is necessary to sustain the change. This step is often the most difficult to perform. The reason for this is because as soon as one change is in place the organization has moved on, and is already thinking about the next change. The following diagram can be really useful in summarising who should do what and how when using the ADKAR model. Individuals that make up the organization don’t just change in isolation. As they change so does the organization. In the following diagram, the traditional stages of organizational change are mapped to the ADKAR Model. It focuses on outcomes rather than tasks. Most change management models focus on what needs to be done but ADKAR focuses on achieving outcomes. The model can be used to measure how well the change is progressing. For each step of the model, progress can be measured at the individual level. Any gaps identified can then be rectified. The model recognizes that it is ultimately people that facilitate change and not simply processes. It provides a clear checklist of things that need to be done to manage change. There are several disadvantages associated with the model. It ignores program management and the need to provide clarity of direction and the steps that are needed to get to the final destination. It is better suited to smaller change initiatives. Only focussing on the people dimension isn’t enough to make large-scale change happen. 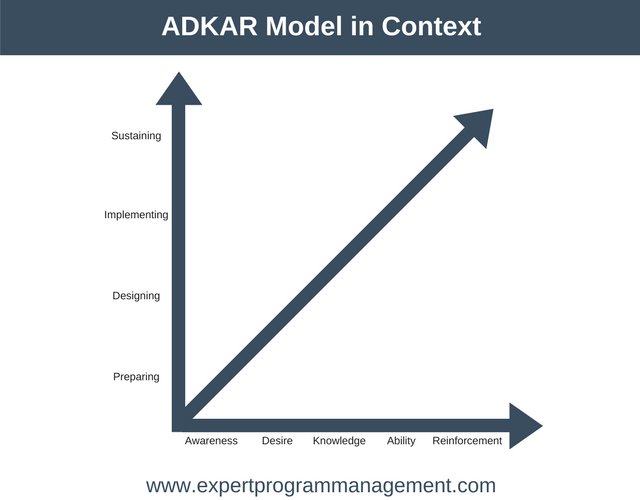 The ADKAR Model is a change management framework. The steps of the model are Awareness, Desire, Knowledge, Ability, and Reinforcement. Unlike most other change management models, ADKAR focuses on the human element of change. It recognizes that individuals must change in order to make an organizational change successful.